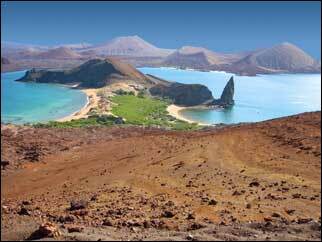 It is the southernmost island of the Galapagos Islands. Espanola teems with wildlife. 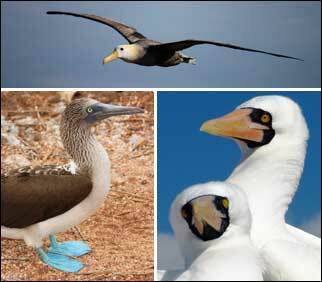 Enjoy the most absorbing wildlife trail in the Galapagos. It starts at Punta Suarez. Explore the nesting site of nearly all of the world's waved albatrosses (top photo). They have wing spans up to 2.5 meters or 8 feet. Also walk through the well-populated nesting sites of both the blue-footed (bottom left) and the nazca (bottom right) boobies. And hike along a striking cliffscape. And you pass a mighty blow hole. Swim, snorkel and sunbathe at the white-sand, crescent-shaped. This small island has a Mars-like landscape, a photographer's dream. Hike up 379 steps to the lookout platform on Bartolome's volcano peak. You'll savor a panoramic view capturing the "Martian terrain" joined with a verdant isthmus featuring the jagged 30-meter (100-foot) high Pinnacle Rock. Santiago Island is in the background. Snorkel with the Galapagos penguins beneath the towering Pinnacle Rock.